Personal Health and the fact it allows me to do great adventures such as amazing hikes and mountain summits. My personal record at the 1989 Houston Marathon where I qualified for Boston with my 3:18:48. It took me ten years to finally break 3:20:00 after just missing many times. I love to give back to runners by helping them achieve their goals. In 2008, I paced my two sons and my daughter at the Houston Marathon to their first marathon finish and my 30th consecutive Houston Marathon. They will achieve their goal and if they are trained, I will make it easy for them with my run / walk approach. It is a shared experience. Let me do the work, and you can know I will be looking to provide the information you need to be successful. I use the Galloway run / walk technique in my marathons. Walk the water stops, walk the hills. 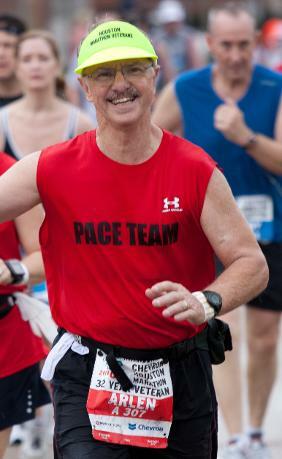 Houston Marathon Pace team coordinator, Houston Marathon Warehouse Manager, very active in many areas at Heritage Grand active senior adult community, organization of adventure trips such as rim to rim Grand Canyon and mountain summits.